PMC is 25 years old. In that time it has grown from a small concern focused on professional monitors, into one of the mainstays of the premium domestic speaker market. The company’s new Twenty5 range celebrates that, and demonstrates just how much it has learnt over the past quarter of a century. We’ve already reviewed (and loved) the largest standmounters of the range, the Twenty5.22s. Now it’s the turn of the starter towers, the Twenty5.23s. This model is already turning out to be the big seller of the range and it’s not hard to understand why. The Twenty5.23s are small. Standing just over 90cm high and 16cm wide, they are compact enough to fit into most rooms without intruding. That’s an important factor. A product can sound brilliant but if it can’t fit unobtrusively into a domestic environment it won’t even make the shortlist in most cases. PMC understands this point better than most. It’s not just the size, either. These are smart. Some may find the metal detailing a little showy, but the 23s look more like luxury furniture than the typical floorstanders sold at this price. There are four finish options – oak, walnut, amarone and diamond black. Our samples are beautifully finished, and everywhere you look, from the crisp cabinet edges and nicely machined stabiliser bars on the base to the lovely single-wire terminals, is finished with care. 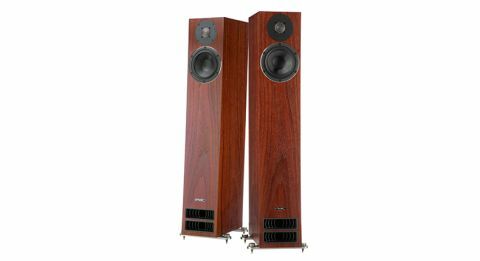 While these may resemble the much-admired Twenty 23s, the only things carried over are the screws that hold the tweeter. The Twenty5’s cabinet keeps the now established slanted look, but the company has done a lot of work to make it as solid and low resonance as possible. The most obvious change is the move to metal stabiliser bars, rather than the full-size plinths of the Twentys. As before, PMC uses isolating rings between the base of the cabinet and the spike assembly to provide a degree of decoupling that the company feels aids sonic openness and detail. The drive units are all new. The 27mm soft dome tweeter is co-engineered with OEM supplier SEAS. It uses a Sonolex dome and is designed to deliver a smooth, insightful sound with wide dispersion. The later is something that’s helped by the protective grille too. PMC has long been a fan of paper cones, but for the Twenty5 range it has moved to a material called G-weave – a resin-bound, fine-weave glass fibre and pulp hybrid cone material that is claimed to deliver improved rigidity without adding too much character. The 23s uses a 14cm unit, designed with a long throw to cope with large-scale dynamics and high volume levels. Its chassis is made of cast alloy and designed to be as open as possible to minimise any impedance to air flow as the cone moves. A PMC wouldn’t be a PMC without the use of transmission line bass loading. A transmission line is a folded path built into the speaker cabinet that takes the rearward sound from the mid/bass unit and absorbs all but the lowest frequencies. These bass frequencies exit the speaker through the mouth seen on the base of the front panel and augment the drive unit’s forward output. This technique is something the company has used since its earliest days and it remains one of the features that differentiate its products from the herd. The big advance for the Twenty5 series is the addition of what PMC calls the Laminair vent. This is the fancy finned structure clearly visible at the mouth of the 23’s transmission line and it’s designed to smooth the way air flows out. The advantages claimed are less noise, faster responses and better low-end definition. And that’s how it turns out. Once up and running these 23s are hugely capable. They’re best in small to medium rooms – if you have a larger space to fill look to one of the bigger models in the range – and deliver a beautifully-balanced sound that can’t help but please. We start off with Beethoven’s Fifth Symphony and are soon caught up in the action. The 23s are surprisingly dynamic, delivering subtle and larger scale dynamic shifts with enthusiasm. They punch hard and go loud with composure. Of course there’s a limit to what such compact boxes can do, but at no point do we find we miss authority or low-end weight. Tonally, things are well judged. There’s plenty of bite in the treble but it remains refined while the low-end is strong without dominating. We’re pleased with the speaker’s composure and their ability to keep things in order even when the music become demanding. Stereo imaging is excellent – just keep these PMCs away from sidewalls and at least 30cm in front of the back wall. Once positioned properly, the 23s render an expansive soundstage that extends well beyond the speakers themselves. It’s precise, stable and layered with care. The claims made for wide dispersion ring true, as the imaging doesn’t falter when we move away from the (relatively) wide sweet spot. Switching to Adele’s 21 shows off the PMC’s excellent midrange performance. Vocals are nicely separated and strongly projected with each nuance and subtle shift in pacing rendered with skill. The 23s deliver a full dose of Adele’s passion on Someone Like You while communicating the drive to make the most of tracks like Rolling In The Deep. This ability to track rhythms is rammed home when we listen to Drake’s Headlines where the PMCs sound right at home, hammering out the hard-charging beat yet still tracking Drake’s distinctive drawl with determination. While the 23s are relatively unfussy in nature, you still need to partner them with talented kit to hear what they can really do. We think the likes of Roksan’s Caspian M2s (CD and amp combination) or Naim’s pricier ND5 XS streamer and SuperNait 2 amplifier pairing would work well. At first we feared for the Twenty5.23s. They don’t look all that different from the well-regarded Twenty versions and cost around a third more. If you’re looking for a top class pair of compact floorstanders we can’t think of a better alternative. Highly recommended.